At Shri Vinayak Packaging Machine Pvt. Ltd., we never compromise on quality. Thus, maintaining stride with global quality standards, we appoint seasoned quality supervisors in our organization who stringently monitor each and every step of production and ensure that only high quality, defect-free Drum Pallet Trucks reach our clients. This is the basic form of forklift, and is generally used for moving pallets (light as well as heavy) within a storage area. 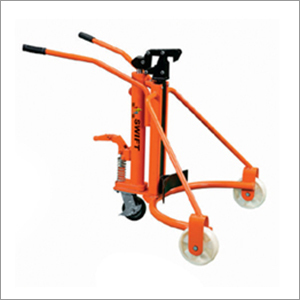 This material handing equipment is also known as drum pallet jacks, which we offer in manual and powered types. Depending on client's requirements, they can order the pallet truck with a hand-powered jack or motorized jack. We are empowered by highly experienced sales and marketing professionals who ensure to resolve the product related queries of clients at the earliest with complete professionalism and proficiency. To guarantee flawless product quality, we have also set up well-planned quality checkpoints throughout various stages of planning and implementation.